The Economic Horizons is a scientific journal, published by the Faculty of Economics -University of Kragujevac, Kragujevac, the Republic of Serbia. The journal is being published three times a year, in Serbian and English, in print and electronic form. 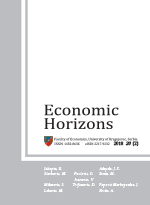 In the Economic Horizons, original papers containing the results of scientifically and practically valid and socially responsible research studies in the relevant fields of economics, business economics and management are published, with the aim of contributing to the improvement of theoretical, methodological-methodical and applicative approaches to dealing with increasingly complex and diverse phenomena and problems in economics and management. The journal is intended for the academic public, researchers, problem-solvers and decision-makers in the key fields of economics, business economics and management, as well as in their subfields - macroeconomics, monetary economics, public finance, banking, financial markets, management, marketing, accounting, business finance, management information systems and other related fields that enable appropriate interdisciplinary researches. The editorial policy implies a continuous enhancement of the journal quality. In accordance with this, relevance in theoretical, methodological, and applicative sense, impact, originality and clarity are the decisively important criteria for selecting the papers for publishing and their classifying. In the Journal, original scientific articles, review articles, preliminary communications, viewpoints, book reviews and reviews of scientific conferences held are published. Only original manuscripts previously unpublished and not submitted for publication anywhere else can be submitted. All the submitted manuscripts are the subject matter of double-blind review process. In the Journal, only the manuscripts that, in the reviewing process, have obtained at least two positive reviews are published. Given its international orientation, the Journal is especially open to scientifically and practically valid contributions from abroad. The Journal is indexed/listed in: EconLit, EBSCO, DOAJ, Cabell's Directories, ProQuest ABI/INFORM, Index Copernicus, Ulrich's Web, SCIndex. The Journal provides the online Open Access to the Content in full text of all published contributions.